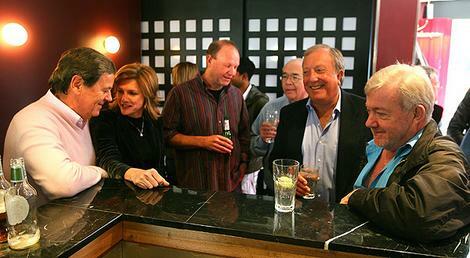 What a priceless photo is this: legends of Australian TV journalism, at wake for Sunday. This photo by Bob Pearce which appears in today’s Sydney Morning Herald, would almost win a Walkley itself. Ray Martin, Ellen Fanning, Stephen Rice, Laurie Oakes, Jim Waley and (Seven’s) Peter Meakin gathered at the Union Hotel in North Sydney yesterday, following the final programme. They were joined by Charles Wooley, Jennifer Byrne, and Nine’s news and current affairs director, John Westacott, who announced the axing last month. Some in Nine will still be smarting over Ray Martin’s on air comments about that decision. “It’s a dopey idea to drop a programme like this because this almost says to an audience ‘well we don’t do current affairs anymore. Why don’t you go and watch the ABC, or go and look at Sky Television, we don’t do it anymore,'” he said. Now a freelancer, Martin can let rip with such pearlers, and he did.